Hose Construction: Hose shall be made from 100 percent high tenacity synthetic yarn, circularly woven and completely protected and locked-in by tough highly resistant synthetic nitrile rubber, forming a single homogeneous construction without the use of glues or adhesives of any type. Meeting all requirements of NFPA 1961. Abrasion Resistance: Hose shall withstand 30,000 cycles on the Taber Abrasion Machine (H-22 Wheel: 1 kg). Key Fire Hose Corporation on request will supply written warranties that DURA-FLOW hose meets a minimum 30,000 cycles. Other abrasion test results (UL, DIN. etc.) can be supplied on request of purchaser. Cold Resistance: Hose shall have a capability of use down to -35F. Hose shall have no apparent damage to cover, reinforcement or linings when subjected to the following cold bending test: a 50ft. 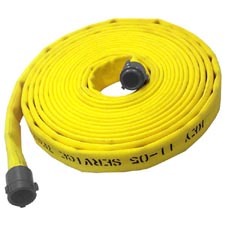 length of dry hose is to be firmly coiled and placed in a cold box at -35F for a duration of 24 hours. Immediately after removal of the hose froim the box, hose should be uncoiled and laid out by one operator. Following this procedure, the hose shall not leak nor show any damage to the reinforcement when subjected to the hydrostatic acceptance test stated above. Ozone Resistance: Hose shall show no visible signs of cracking to the lining or cover when tested in accordance to ASTM D518 Procedure B (100pphm/118F/70 hours). Chemical Resistance: Exposure to sea water and contamination by most chemical substances, hydrocarbons, oils, alkalis, acids and greases must have no effect on the short or long term performance of the hose. A chemical resistance chart is available and Key Fire Hose will supply specific chemical resistance data on request of purchaser for unique applications. Heat Resistance: The hose, when subjected to a static pressure of 100 PSI, shall be capable of withstanding a surface temperature of 1200F for a minimum of two minutes without rupture or damage to the synthetic reinforcement. *** NAFECO INC. reserves the right to modify any specification without prior notice to meet or exceed changing standards. Customers are advised that special diameters or construction characteristics can be produced on special request.